When he’s not at work, Seth enjoys running, landscape photography, and spending time with his family. He and his wife have three kids, and they like to have fun outside playing baseball and going for bike rides. Seth develops tests and compares and implements methods to help individuals, utilities, and government agencies better understand risks, decrease the vulnerability, and increase the resilience/sustainability of the systems they work with. 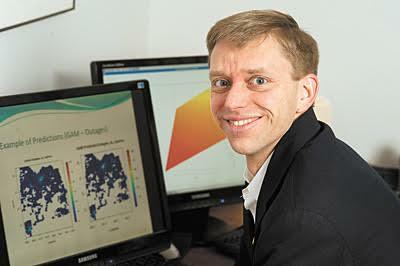 His research focuses on electric power systems, water systems, and urban areas. A lot of Seth’s motivation comes from working with students. It is inspiring for him to see students working really hard to solve problems, and he tries to be a strong mentor and role model by showing them how to be perseverant and not get discouraged by challenges. Having great teachers in middle school was key for encouraging Seth to pursue a career in science and engineering. He grew up in a rural area with streams and swamps nearby, so he was interested in water systems from an early age. He also attended science summer camps in middle school and high school which cultivated his curiosity. About five years ago, Seth was struggling to get new grants and was nearing a point where his funding wouldn’t be enough to pay everyone he currently had working in the lab. He was one semester out from having to make some difficult decisions and was really apprehensive. Seth had the students in the lab write fellowship applications, and all three were awarded fellowships! Some of his subsequent grant applications also came through, but the preceding period of uncertainty was stressful. Seth is excited to have recently published a paper in Climatic Change on data from one of his PhD student’s projects. They applied their short-term hurricane power outage forecasting work to a more long-term setting to examine how changes in hurricane hazards, potentially induced by climate change, may change the risk of power outages in different areas in the U.S. This was a rewarding collaborative effort that addressed an important question to society. Seth has many fond memories of the time he has spent in Norway. He has an adjunct appointment at Stavanger University there and was there for four months last year on sabbatical. The university has a superb intellectual environment, particularly for risk research. He lived in a picturesque little town across the fjord from Stavanger and enjoyed a beautiful commute by ferry every day. One of the traditions that Seth’s lab has started is going out on group runs together. Seth likes running so he would often invite students in the lab to join him on these adventures. A lot of funny incidents have occurred on these outings, including getting caught in torrential downpours. He also likes taking the lab backpacking or hiking when they are out of town at conferences. For young scientists trying to decide on an area to focus their research, do what moves you, what you think is important, and what you are interested in. Once you decide what that is, you can work hard to get that research funded and find PhD students to help you make progress in that area. Seth Guikema’s research focuses on risk and sustainability analysis and statistical learning theory, particularly in the context of urban infrastructure, natural disasters, and terrorist attacks. His background is a combination of Engineering Risk Analysis (PhD) and Civil and Environmental Engineering (BS, MS, ME, Postdoc). He is an Associate Editor for the ASCE Journal of Infrastructure Systems and serves on the Editorial Boards of several journals including Risk Analysis and Reliability Engineering & System Safety.